This article was written by Dean Hanley and was featured in the Jan 13, 2012 issue of Sports Collectors Digest. The 1951 Topps Red Back and Blue Back baseball card sets were the first pure baseball card sets ever issued by the Topps Gum Company. Due to the cards being small size and total number, as well as plain in design, the 1951 Topps Red and Blue Back cards appear somewhat elementary when compared to the later Topps issues. However, despite their simplicity, the two 52-card sets managed to lay the strong foundation on which the company would build their baseball card empire. Topps realized that their first attempt at producing baseball cards would fall short of the product that Bowman had continued to perfect over the last three years. With that said, Topps decided to use a gimmick in order to differentiate themselves from their competition. Thus Topps produced their 1951 Topps Red and Blue back cards in a way that created a game that kids could play. The cards measure 2” by 2 ⅝” and have a background and back design similar to playing cards. The red back set has a total of 52 cards with two variations (#36 Gus Zernial and #52 Tommy Holmes have two possible teams), while the blue backs also have 52 total cards, but with no variations. 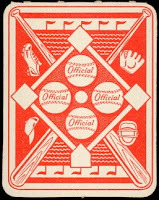 The front of the card has the game printed on the corners and the player’s head printed in black and white in the center. The card number appears on a slant in the middle of the card. The cards also include a short paragraph of statistics in the lower left corner. The most expensive cards in the 1951 sets include Yogi Berra from the Red Back set and Richie Ashburn from the Blue Back set. Of the 104 cards in both 1951 Topps sets, thirteen of the players would eventually be enshrined in the National Baseball Hall-of-Fame. Topps included all of the major league teams in these sets, ensuring that at least four players from each club were represented in the sets. For this year, the Indians had the most players on cards with eleven, closely followed by the Yankees with ten. The Reds, Tigers, and Athletics each had only four players pictured on 1951 Topps cards. Sales of the 1951 Topps Blue Back and 1951 Topps Red Back cards were extremely disappointing. Ultimately, boys were the judges of which company made the best baseball card and in 1951, the boys placed their votes by giving their hard-earned pennies to Bowman instead of spending them on the inferior Topps cards. Today, there are many more 1951 Topps Red Back cards in circulation compared to the blue backs. However, this was not necessary the case back in 1951. This is partially due to the discovery of cases of red backed cards in a warehouse in the 1980’s. The red back cards that were found in this particular discovery are usually easy to identify because they are in such great condition and the perforations can still be seen on the card edges. By the time the red back cards were discovered, the card collecting hobby had matured. Now more than ever, collectors were aware of the financial wisdom that stemmed from keeping cards in pristine condition. The blue back common cards are up to ten times more expensive than the red backs, particularly in the nicer conditions. DeansCards.com has over a million cards in stock and our online inventory is a great indicator of card populations in the hobby. The current online inventory at DeansCards.com confirms that there are many more of the red back cards in existence today when compared to their blue backed counterparts. While DeansCards.com will usually have a nice selection of the 1951 Topps Red Back cards, we generally only have a few of the Blue Back cards in stock. Despite the major the Red Back discovery, there are far fewer 1951 Topps cards in circulation than any other Topps issue. In most cases, a low card population means that the cards will have a high value. We all learned in Economics 101 that: low supply + high demand = high price. Both the 1951 Topps Blue Back and Red Back Sets certainly have a very low population (or supply) which helps to increase their value. The problem however, lies in the notion that despite their overall scarcity, demand for the 1951 Topps sets is low when compared to the other sets of the 1950’s. Very few kids collected the set back in 1951 and few collectors choose to pursue it today. As a result, the two 1951 Topps sets are still affordable, especially the more plentiful red back cards. Meanwhile, back in Philadelphia, Bowman was busy making improvements to the baseball and football card sets that they issued in 1950. In one year, Bowman managed to increase both size of the cards, and number of cards in the set. 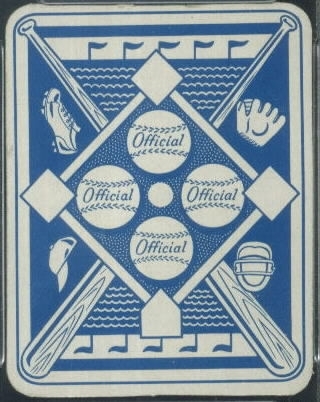 In 1951, Bowman produced a very attractive set with hand-drawn action shots and a full paragraph description about the player on the back of the card. The 1951 Bowman baseball card set also had the advantage of star power. Two of the biggest stars of the 1950s, Willie Mays and Mickey Mantle, were under contract with Bowman. Thus these two superstar's rookie cards premiered in the 1951 Bowman set, once again giving Bowman an edge up on the competition. The product that Bowman presented to the market in spring of 1951 was clearly superior in every way to the Topps offering. Recently, I was speaking with one of our customers who is in the process of buying every Topps vintage complete set ever produced from us. He is buying the complete vintage sets for investment purposes. With the uncertainly of real estate, stocks, bonds and cash and with the price of gold near record highs, buying vintage sets as a long-term investment is becoming much more popular option with investors than it has been in the past. We are down to the last few Topps sets, with 1951, 1952 and 1967 remaining. After considering the 1951 sets in terms of appearance versus cost, our customer decided to break the trend and purchase the 1951 Bowman Baseball card set instead. This story is typical and speaks volumes about the hobby’s opinion of the Red and Blue Back Topps sets of 1951. As if the design disadvantages of the Topps sets were not bad enough, the taffy that came with the cards turned out to be toxic. The cards were printed with a glossy varnish on them that rubbed off onto the taffy, resulting in a chewy substance that both smelled and tasted like paint. It was said that upon opening the packs of cards, you were almost overcome by the terrible odor. At that time, the 1951 Topps Red and Blue Back sets were remembered more for the unpleasant odor of the taffy, than the cards themselves. Few card sets ever produced turned out to be such a complete disaster. If the dull and boring look of the 1951 Topps sets didn’t cause the kids to puke, the toxic taffy certainly did. The vastly inferior product produced by Topps in 1951 failed to make a dent in Bowman’s dominance of the baseball card market. Topps lost money on its 1951 baseball card sets and sued the company that printed the cards that ruined the taffy. This would be the first and last time Topps included taffy alongside of their baseball cards. Topps clearly had the inferior product in 1951. 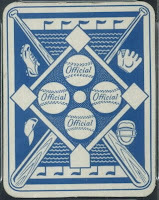 The Topps cards were second-rate in terms of design, card size, set size and the confection that accompanied the cards. In order to compete with Bowman in 1952, Topps decided that they had no choice but to take their legal chances and issue baseball cards with bubble gum instead of taffy. 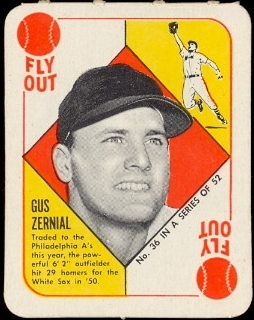 The “giant sized cards,” with colorful card fronts that placed an emphasis on the player’s face and attractive card backs that were packed with statistics from the previous year. Topps also gave up trying to make a game out of its cards and instead focused on creating a product so superior, that kids would abandon Bowman’s baseball cards altogether. The 1951 Topps Red Back and Blue Back Sets may be failures if judged solely on design or profitability; however, the 1951 sets marked an invaluable developmental step on the way to the production of the modern baseball card. By the next spring, all American eyes would be back on baseball and Topps would be ready to take the sports card market by storm- forever changing the hobby.